When strawberries are in season, you will definitely want to make this Strawberry Tart. The shortbread base gives it a delicious buttery flavor which combines nicely with the whipped cream and juicy strawberries. The caramel layer takes it to the next level! 1. In a bowl, combine crumbled shortbread with the butter. Using a fork, incorporate the butter with the shortbread until it is well blended. Press into an 8 or 9 inch spring form pan or tart pan. Refrigerate while you prepare the rest of the ingredients. 2. Melt the caramel in the microwave for 10-20 seconds depending on your microwave. Let cool for 1 minute, then either pipe the caramel onto the shortbread base or smear with the back of a spoon or off-set spatula. Refrigerate again. 3. Whisk until the cream reaches stiff peaks; set aside. 4. Rinse and slice the strawberries. Remove the tart from the fridge and pipe a generous layer of cream over the caramel layer (You may decide to leave some of the caramel visible at the sides to create a more dramatic view of the tart ingredients). 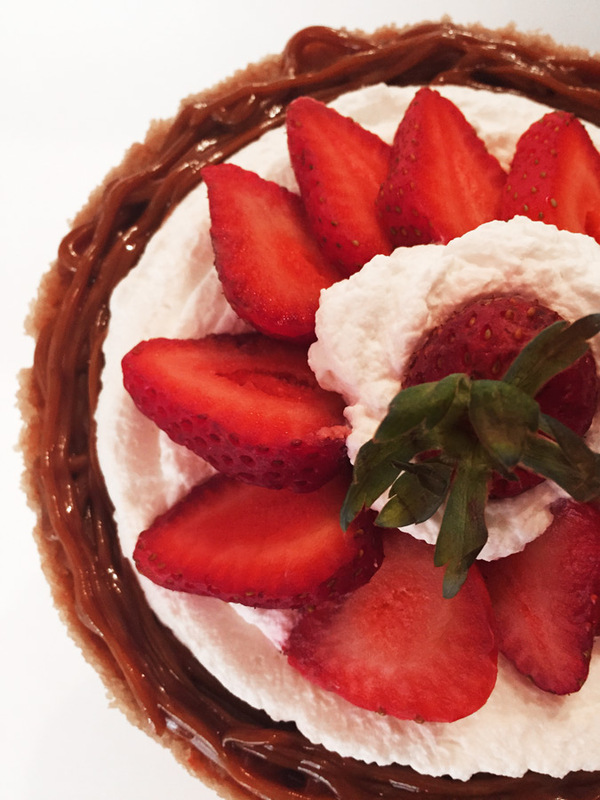 Place the strawberries in a concentric circle on top of the whipped cream. 5. Pipe another small circle of whipped cream in the center of the strawberries and place 1 or 2 more strawberries on top. This entry was posted in Blog and tagged caramel, Shortbread.